Wheelabrator has developed best practices for the handling of 10 percent of residual waste that remains after the waste-to-energy process and in-plant metals recovery. Wheelabrator operates four ash monofills that accept ash from our waste-to-energy facilities and other private sector companies or municipalities in the U.S.
Ash is transported to the sites in covered, watertight trucks and unloaded at the monofill working face, spread with a bulldozer, and compacted with a vibratory roller. To prevent dirt and residue from leaving the monofill, every truck exiting the facility is thoroughly rinsed at an on-site truck wash station and access roadways are swept daily. From the ash, further ferrous and non-ferrous metals not removed via in plant systems are recovered and sent to advanced metal recovery upgrade facilities to be recycled. 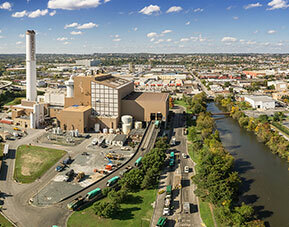 Years of testing ash from waste-to-energy facilities have shown that residual ash is safe for disposal and even reuse. The industry is currently engaged in new research to identify environmentally safe and sustainable beneficial ash use opportunities that will divert ash from monofills and lower ash disposal costs. If you'd like to learn more about Wheelabrator's services, please contact a member of our team at services@wtienergy.com.